Turn actuating screw with hex key until tight, approximately 100-150 inch lbs. torque. Using hex key, loosen actuate screw until it is flush with nut body. "DO NOT REMOVE SCREW"
Tighten Jetnut by hand to reset pressure pad system. Jetnut can now be removed by hand. Back out actuate screw until flush. Insert 1/4-28 straight refill fitting. 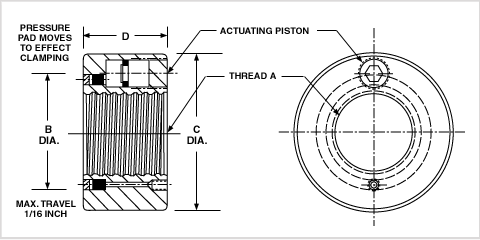 With grease gun, fill nut until piston is firm against actuate screw. Remove refill fitting and replace 1/4" cone point screw. Hydraulic pressure is distributed equally over entire area of the pressure pad (diameter B). This action compensates for out of squareness of the work pieces or faces where the Jetnut is used. Note: Operating temperature is -15° to +260° for continous use. Important: When ordering, check pressure pad diameter in relation to mating part.